When Good Restaurants Go Bad! We just returned from a wonderful trip to Willsboro, NY after a wonderfully relaxing family vacation on the shore of Lake Champlain. After settling in and unpacking we headed out for something to eat. We stopped first at a small grocery store attached to a gas station (which seems to be the norm in this neck of the woods) and asked the employees for a good family place to eat. Two of them recommended Zeke’s pub and, not seeing a huge amount of options, we decided to give it a try. From the start the signs were not good. A surly waitress waved a hand to the near empty restaurant and indicated we should take our pick. (Warning sign #1) The fact the restaurant was empty at dinnertime on a Saturday should have been a sign to turn tail and run, but we toughed it out and sat down at the only table that could fit five. The menu contained the usual pub fare and so the men selected the usual assortment of burgers, while my daughter and wife went for pizza and fish and chips respectively. (Warning sign #2) We were a little surprised when the french fry options were presented as “hand cut or frozen”. I honestly thought I had not heard correctly because I have never been to a restaurant that offers you frozen french fries, even if that is what many of them actually do provide. We all opted for the hand cut. Perhaps that was a mistake as we will see later. There followed a long delay in which we sat in direct line of the A/C and tried to stave off hypothermia. We made it…just. The food finally arrived and we tucked with gusto. It had been a long day and we were famished. That enthusiasm soon faded when we discovered the food was tasteless. The menu said that Joanne was supposed to get two pieces of fish with her fish & chips, but she only got one. She was going to complain, until she tasted it and decided to just let it be. Then we found the first long black hair in Joanne’s fries…then Greg found a long BLONDE hair in his burger…and at that point we were pretty much done. We paid the bill and left vowing NEVER to return to Zeke’s again. A couple of days later we stopped at Johnny’s Family Smokehouse just a little way down the road from Zeke’s. What a difference! The place was packed and we had to eat in the bar area. We were greeted warmly, the menu was interesting and the food was excellent. The pulled pork sandwiches were wonderful, the calzone tasty and we left feeling full and happy with a new discovery. This place definitely warranted a second visit before we headed home! As always happens on vacations the last day arrived far too quickly and, before we knew it, we were heading out for the last meal of the trip. We asked the kids where they wanted to go and Johhny’s was a unanimous and resounding favorite. They received no argument from us and off we went. (Warning sign #1) We pulled into the parking lot and, despite being Friday night, it was mostly empty. Odd but this meant that the large open air section near the carpark was available and we opted to sit outside as it was a beautiful night. As we walked to the door one of the kids pointed at the new sign which read “Johnny’s and Zeke’s”! The “Zeke’s” part was more of a footnote at the bottom of the sign… they seemed to be trying to make that part look unnoticeable. We should have turned around right then but the sign nearby read “The best of both worlds” so we figured that they must surely have kept all the good stuff…right? (Warning sign #2) The menus arrived…they were the menus from Zeke’s. They were even the same cheap white paper, rather than the high-quality Johnny’s menus. The glasses were the cheap plastic glasses from Zeke’s also. Both places had pulled pork so Joanne asked if this was the pulled pork we had the other night only to be told “No, this is a different recipe”. I eyed the car parked nearby and absentmindedly fingered the car keys. (Warning sign #3) The first thing out of the waiter’s mouth was a long list of things they were out of, which covered about half of the menu. (Warning sign #4) The french fry options…you guessed it…now it was hand cut or frozen! Not only that, but you now had to pay an extra two dollars to just get the french fries, unless you would prefer your burger with cheap Lay’s potato chips straight from the bag (a Zeke’s specialty) . I chanted the optimistic mantra that surely they would keep the best while we waited for the food to arrive. (Flashing neon warning sign #6) Our neighbor said he couldn’t understand it because he knew the chef…and that was when we heard that we heard that the old chef had quit because he didn’t like the new arrangement. Yes…it seems we were back to the “Chef” from Zeke’s! We had plenty of time to listen to this tirade in detail because about 45 minutes had passed since we placed our order with still no sign of it appearing. The waiter did come and tell us they were backed up, which was hard to understand considering they place was nearly empty. I was now actively campaigning for an immediate exit after leaving enough cash to cover the drinks. Joanne was much more hesitant as she had never left a place after ordering food. That continued right up to the point where we pointed out that one of the things our neighbor complained about (and the reason for the disgusting comment) was that he found hair in his food. The look on her face was priceless, followed by a comic swirling dust cloud as she headed for the car at top speed. I pushed some money under a glass and, without a second glance, peeled out of there in a tire smoking dash for safety. We went to another restaurant and, admittedly, the food there wasn’t that great either. But it was hairless, and that was good enough for us. As we were driving home from that other restaurant, we passed by the sad building that was once home to a wonderful restaurant. The parking lot of this PUB was completely deserted… at 9:30 on a Friday night. That was a sure sign that something had gone horribly wrong. We now have a new phrase in the household. To be “Zeke’d” is to take a great restaurant…and destroy it thoroughly. Also, whenever we pull into a restaurant, we double-check to make sure there’s no “and Zeke’s” on the sign. Ahh, family vacations, they are all about making memories…and this one is going to stick with the family for a while! Doing the right thing…even when you’re scared! When I was in second grade we lived in a little street in Plumstead, East London. It was the sort of place where the houses were all joined together and everyone knew everyone else’s business. For the most part everyone was in the same boat with little money to go around. Across the street lived a chap named Clem. Clem was one of the few people that we considered successful since he ran a construction business and owned both a van and a Jaguar when most people had neither. Clem was well regarded and generally considered a decent sort. His wife was a permanent fixture hanging out of the upstairs window and surveying the street. Nothing much escaped her eyes. With limited resources improvisation was the name of the game and one day I found a large piece of elastic and used it to fashion a simple catapult. To say it wasn’t accurate was a huge understatement, but what it lacked in directional ability it more than made up for in power. I spent a happy few hours dropping stones into the little cup I had and flinging them up the street with gay abandon. But then I pushed my luck a little too far with the size of one of the rocks. It was a little large to fit in the cup and was quite a snug fit. I figured with sufficient power it would easily fly out and, as I had done dozens for times before, aimed up the street and let fly. Unfortunately in this case the rock did not immediately fly out, instead staying in the cup just long enough to fling around sideways and exit at a very acute angle, right into the side window of Clems van. There was a pop and the window was immediately transformed into a million small fractures, rendering it almost opaque. I did what any self respecting 7 year old would do. I ran! I shot into our house, ran up to our bedroom at the back of the house and sat on my bed in a panic. What should I do? Did anyone see me? Could I get away with this? Knowing that we didn’t have the kind of money available to repair a window like this I was sick with worry. But, as I sat there, it slowly dawned on me what I had to do. It took a while, probably 20 minutes or so, but I eventually found myself walking across the street and knocking on Clem’s door. I waited for the anger, the righteous indignation, and the demands for reparations that neither I nor my Mother had any means of paying. In those days a good whooping wouldn’t have been out of the question either, and when my Mum found out I’d get the same from her. Instead he just looked at me and said “I know. Don’t worry about it.” And, without another word, he went back inside and closed the door. He never told my Mother and it was never mentioned again. A few days later the window was repaired and life went on as though nothing had ever happened. I often wonder what would have happened if I had not come forth. Would the result have been the same? Would I have been the same? I don’t know, but I do know that i felt an enormous sense of relief and gratitude at how things turned out. I never expressed my gratitude to Clem for the kindness he showed that day, so I’ll say it now. Thank you Clem, you were a real gentleman. Building an F450 quadcopter – Maiden Flight! We finally had a break in the weather long enough to get outside and get up in the air! Before leaving there was some question about which two flight modes I should start with. Key candidates were Stabilize, Altitude hold and Loiter. I finally opted for the first two. Stabilize because it doesn’t rely on anything fancy, and then Alt. hold to make flying a little easier. The result? In a word – awesome! It’s been a while since I was able to fly and it was great to finally get back into the air. See for yourself. The F450 has some wobble to it. Nothing terrible and it should be something we can fix using the Autotune feature of the APM. I’ve shared my parts list including links to where I bought things in case anyone is interested. You can see those details here. Having seen one too many videos where the quad flips over on takeoff I was understandably nervous about trying our new baby out. It seemed that at every turn there were little details that needed to be checked and re-checked. For example, we checked the rotation of the motors and S. then fitted the props according to their direction. Later I noticed that we had the exact opposite of what was shown on the APM website. Our props should have looked like this but were not. So, when S. wasn’t looking, I switched them. Fortunately I had woken up that morning with an idea that would allow the quad to fly a little, but not enough to flip over if things go wrong. It didn’t take long before I had it lashed to our table tennis table and we were ready to try her out! With S. videoing the first test was a spectacular non-event. I powered up and slowly increased the throttle until full throttle was reached. We had plenty of noise but absolutely no lift at all! Then I realized. S. had been right all along and I had switched the props which were now pushing it DOWN! A quick switch of the props and we were back in business. This is when I thanked my lucky stars that I didn’t trust myself to try it without a safety net. Every time it lifted up it would go wild and try to flip over. Fortunately the string kept it in place, but it was all over the place and none of the controls made any sense! See for yourself! I checked things over again and realized my mistake. I had plugged the motors into the APM board with output 1 going to motor 1, output 2 going to motor 2 etc. in a clockwise pattern. However, as you can see from the diagram above, the ONLY motor I got right was number 1! Switching the connections on the flight controller had us finally up and running. It now behaved, didn’t try to flip anymore, and I could lift it up and move it backwards, forwards, left and right. Forward and backwards was reversed because for some reason the APM sets it up to expect the ELE control to be backwards. No problem, it just took 30 seconds to change that on the transmitter. While it seemed to be working it was very twitchy and super sensitive to the controls – nothing like my Phantom which was very docile. I posted the video on the quadcopters FB page and our good Samaritan made a comment about how twitchy it seemed. I then found out that the latest version of the Mission Planner software has a sliding scale from 1 to 100 where the higher the number the faster it responds. Guess where mine was set…yup…100! I backed that off to 80 which seems to have calmed things down nicely without taking all the fun out of it. One last thing. 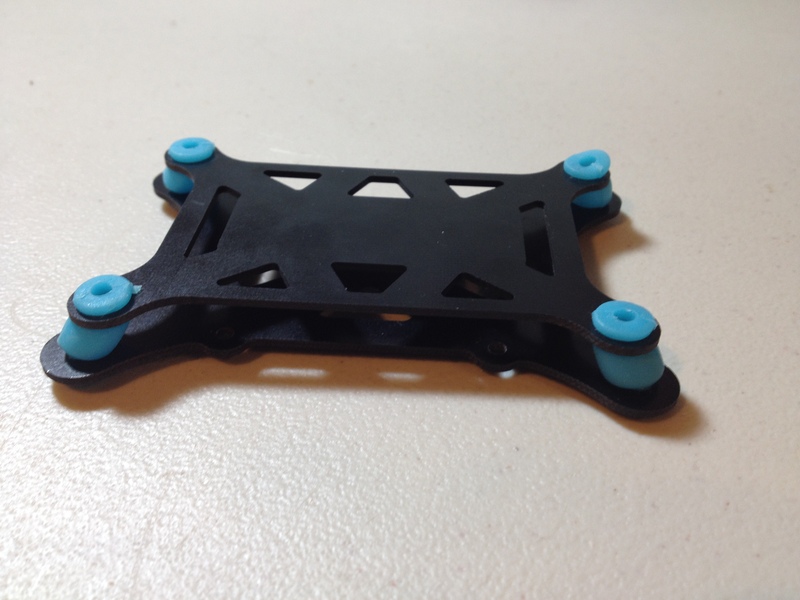 Remember I said that my motors were the exact opposite of the picture on the APM website? I was under the assumption that it didn’t matter as long as they the same rotation was on the opposite corners. Turns out that is incorrect and that not having it the right way around is going to cause problems with yaw (spinning on its axis), and possibly more. 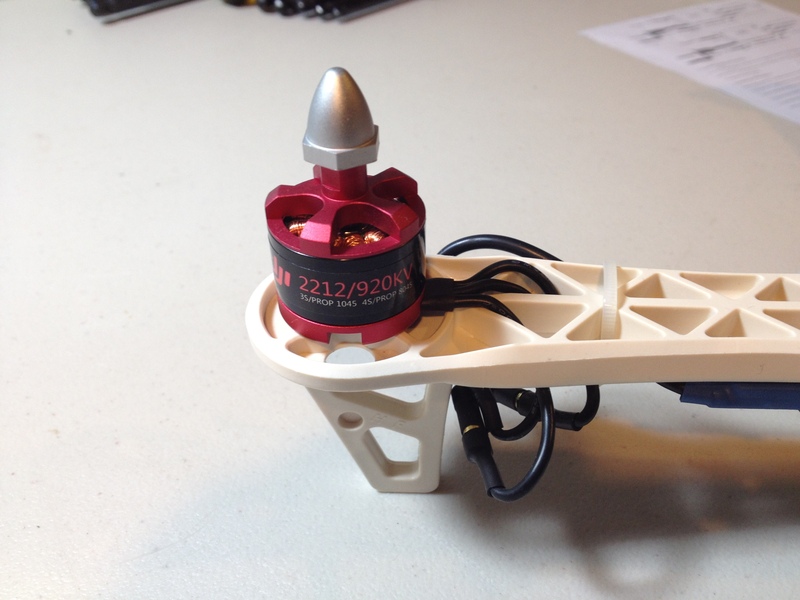 So, after some gentle teasing by my friends about not knowing how to fit props, I switched the bullet connectors so that they now all spin the right way. After all those changes I put it back on the “test rig” and what a difference! It was beautifully smooth and easy to control. See for yourself. So, that it is. There are still many tweaks to do, such as setting up the battery failsafe and adding LED lights, but really the next big step is to wait for a clear day and take her out. I can’t wait!! My daughter was finally able to fit me into her schedule we had a date for 9:30am on Saturday. We spent a little bit of time on Friday night trying to work out the best way to piece everything together. To my surprise the APM 2.6 was too large to fit onto the PDB without sitting on the solder joints, and there was definitely no room for the damping plate. After much debate, and taking advice from the FB Quadtopers page, we finally decided there was no option but to switch places and put the battery inside and the APM on top. First task of the day was assembly of the damping plate. Let me just say, for the record, the person who came up with the idea of forcing those little squishy balls into those tiny holes on the plates is an agent of Satan. Getting those things forced through 8 holes without tearing them took almost 45 minutes and included some serious tongue biting to avoid teaching S some bad habits. While I was busy cursing the damping plate S. was busy attaching the frame spars to PDB and then flipping it over and starting on the top plate. Blue loctite was used to keep things secure but not permanent. 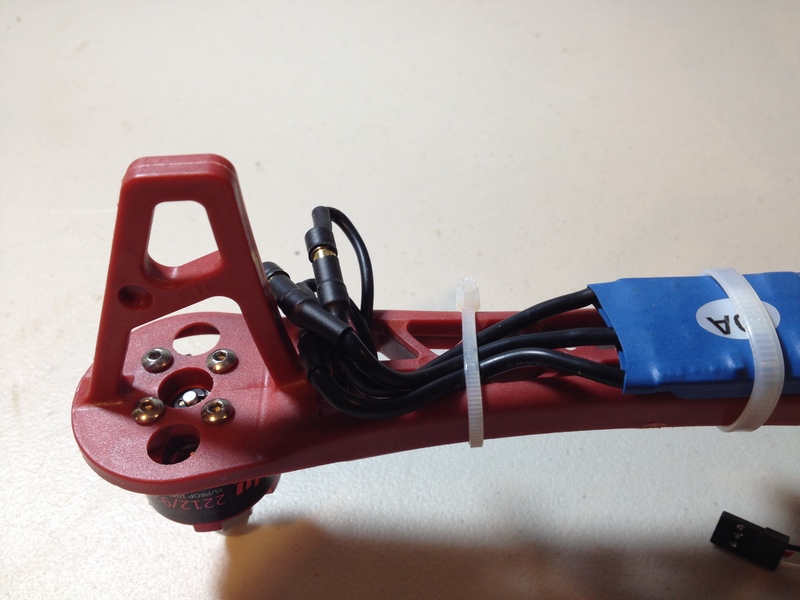 With that done it was time for us to attach the motors and secure the ESCs to the frame with zip ties. Pushing in those little bullet connectors was tough, especially after the punishment my digits suffered putting the damping plate together. Had I been more confident I would have cut the wires shorter before soldering to the PDB, which would have left less slack. But with some zip ties we were able to make them secure, if not exactly pretty. 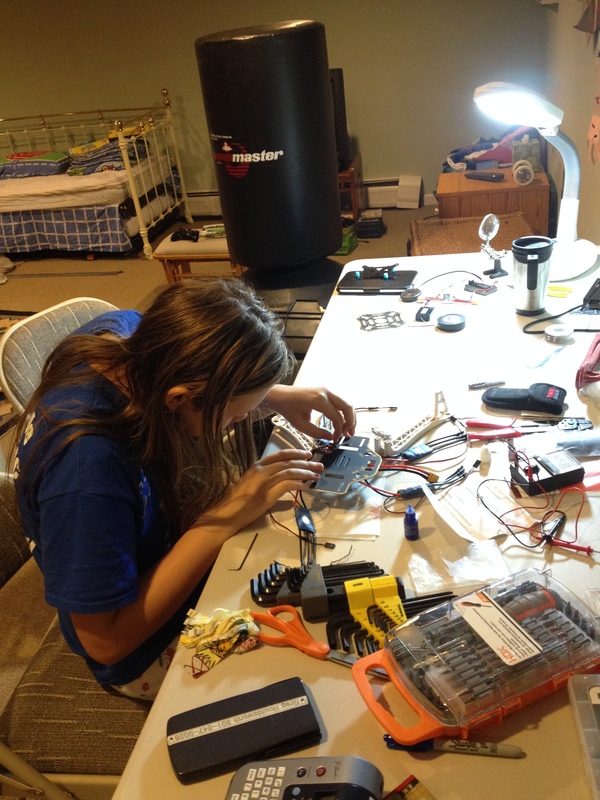 At this point we were ready to attach the flight controller, power module and battery and start configuring. Getting to this point had taken us to 11:30. I was all for pressing on but S said “No, I don’t want to finish it yet. I’m enjoying building it with you”. Awww! 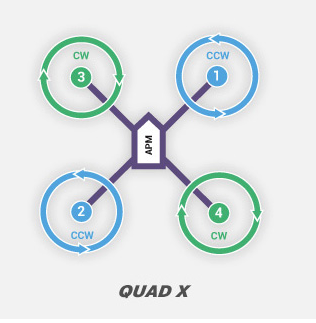 We talked about what the next steps are and how the flight controller works with the ESCs to control the motors. This was easy for her because we had built a robot with a Raspberry Pi, so she understands that the power cannot all flow through the computer. 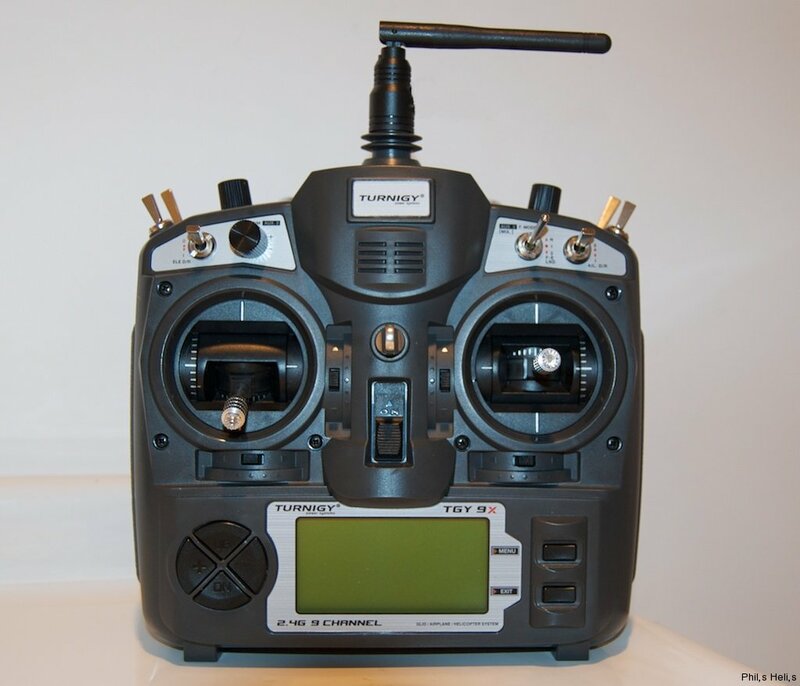 We also took a look at the Turnigy 9X transmitter, which is very different from the Phantom one that she has used before. This was a question that I didn’t have an answer for, but a quick look on the Arducopter site and know we know that in loiter or altitude hold mode the throttle just has to be within 40-60% range and it will hold altitude. For once it is my calendar that is getting in the way. I have a very busy week ahead and it doesn’t look likely that I will get around to doing anything significant until next weekend at the earliest. Using a pair of bent nose pliers makes putting the little squishy balls in place simple. I wish I had those the first time around – I could have avoided a lot of cursing. As a parent you want to help your kids – it’s only natural. But take a step back once in a while and they might just amaze you. Each of my kids has recently given me cause to rethink their limits and be blown away by their abilities. It started a few weeks back when my 13 yr old was making a music video for a school project. He had already selected his music, found a karaoke version and written his own lyrics. He asked for help mixing his audio on top of the music but then refused any other help. A few days later he showed me the finished result – all his own work – and I was totally blown away. You can see the results of his efforts here and I’ll let you be the judge. Next up…my eleven year old daughter. Her old iPhone would no longer hold a charge and so I ordered a new battery from iFixit.com. I was all set to replace the battery – not a task that Apple makes easy – when she asked me not to start without her. She then proceeded to take on the entire procedure, following the on-screen instructions in a calm, methodical manner that would have been beyond many adults. 30 minutes later she had a fully restored iPhone and I was in awe of this young lady. Finally my older son has been helping out with a local charity shop by taking pictures for them every weekend and posting items for sale on their website. When he started this he was all fingers and thumbs. He was shy, awkward, forgot the camera once and turned up with a dead camera another time. Yesterday he strolled into the office, picked up the camera and checked it over with a practiced air. I had a little time so I went with him to give the dog a much-needed walk. When we arrived at the store I was amazed to see the calm and easy way with which he interacted with everyone, and how warmly they received him. This wasn’t my little boy anymore, this was a young man making his way in the world and I couldn’t help but feel proud for him. It’s easy to forget that the role of children is to push limits. For them limits change on a daily basis – one day they can’t reach the faucet and the next they can. Challenging limits; physical,mental or imposed by other, is not only normal but to be expected. Think on that they next time they challenge your authority. Children need boundaries or they feel adrift, but as parents we have to recognize that those boundaries change every day and we need to change with them. The next time you are doing something for your kids take a step back and consider whether by “helping” them you are actually them holding back. I guarantee they will blow your mind if you would just let them. A few weeks back my Daughter asked me to come with her as she took the family Shih Tzu for his regular walk. I reminded myself that these opportunities won’t last forever, put down what I was working on and we set off in the rain. She likes to chat and was quickly updating me on her latest craft projects, exploits of friends, books she’s reading and stories that she’s writing. For my part I can’t help but look for lessons everywhere so, as she spoke, I asked questions such as how she thought she should deal with someone who was being mean or why things worked in a particular way. Listening to her tales from school I then provided some stories from my school years and she was able to draw parallels with her own experiences. Before I knew it we were deep into a discussion about a book I had just finished reading. The book (Change of Heart) has a dilemma in it – should a dying eleven year old girl receive a heart transplant from the man who murdered her Father and Sister and, if she doesn’t want it, should her Mother force her to take it. Despite being only ten we had a very mature chat about this, explored things from different angles and, in the blink of an eye, we were back at the house. I’m really enjoying these moments. The lack of screens, phones and other distractions leaves us with little to do but actually talk to each other which, in today’s modern world, is a rare and precious thing. 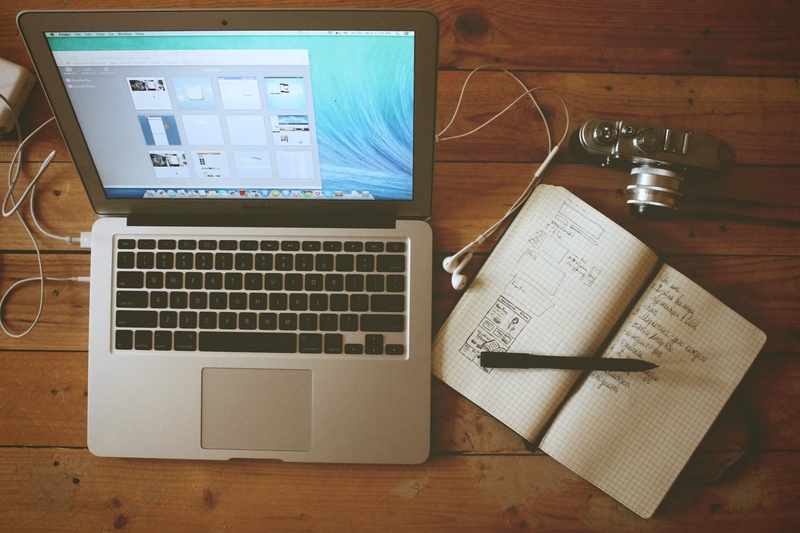 Working from your local coffee shop? Encrypt or die! My Father's Dragon – Free audio book for kids.